"On stage a woman stands, the greatest rock singer of her generation. Standing around her is the hottest band that a record company can buy. In front of her, an audience of thousands of expectant fans. 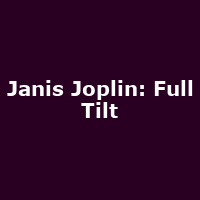 She is Janis Joplin. She is utterly alone. A celebration of a sound, a scream of protest at the universe. Full Tilt Boogie."